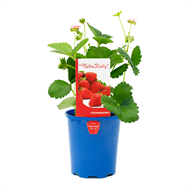 A compact strawberry bush, ideal to grow in a pot. Produces large numbers of strawberries from Summer through to Winter. Flowers are pink.